With the Wireless USB Missile Launcher you can defend your cubicle from unwanted co-worker intrusions or defend your room from unwanted siblings! The Wireless USB Missile Launcher provides the flexibility of a wireless setup, giving you the freedom to place the Wireless Missile Launcher up to 15 feet away from your computer! It features 3 foam projectiles that can be fired up to 20 feet at an extremely fast rate (at least twice the range of any other product on the market). 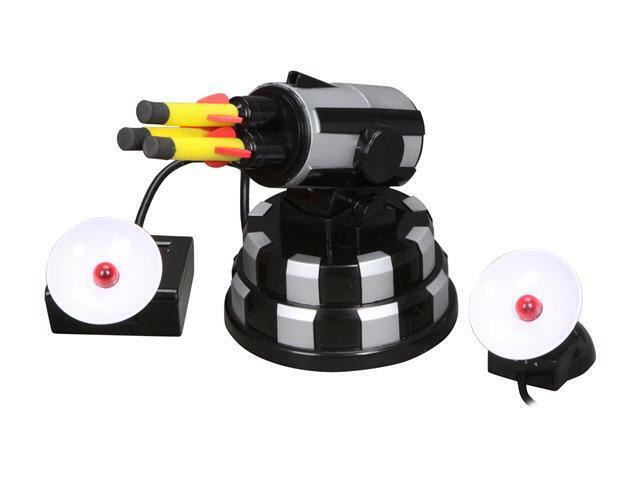 Turn, swivel and move the Wireless USB Missile Launcher up and down from your PC to aim the missiles towards your target. The computer control panel can be controlled by your mouse or keyboard. Realistic sound effects bring the missiles to life as they leave the launcher towards your target. Wireless Setup: Place the Missile Launcher up to 15 feet from your computer! Individual Package Size: 8.86" x 5.91" x 3.94"
Pros: Wireless, shoots reasonably far with pretty good accuracy. Movement responds well to commands. Cons: When you fire, it takes a few seconds to fire during which time it makes an aweful amount of noise. Not good for trying to target a) a moving coworker, or b) a coworker you've hit before and knows what the sound is. Other Thoughts: Great concept. Shame it isn't better for stealth coworker annoyance/assault. Pros: It's pretty responsive for it being an infrared device and it shoots farther than the box says it will! Cons: the launcher is a bit noisy and makes it really difficult to surprise someone less they havent seen it before. Cons: Wireless honestly needs line of sight in the end. Darts are kinda small, but ehh no biggy. Other Thoughts: Now back to waging war on my boss. Newegg rocks other than that other unnamed company who I ordered this from when instock and then magically wasn't instock and I got a "its not in stock, will be in stock feb" good luck on a christmas present. Never doubt newegg!